Job Growth Might Be Slowing Overall — But It's Surging For New College Grads : The Two-Way Congratulations to the Class of 2016! They are graduating into the best job market in a decade, especially for those with degrees in business, technology or engineering. 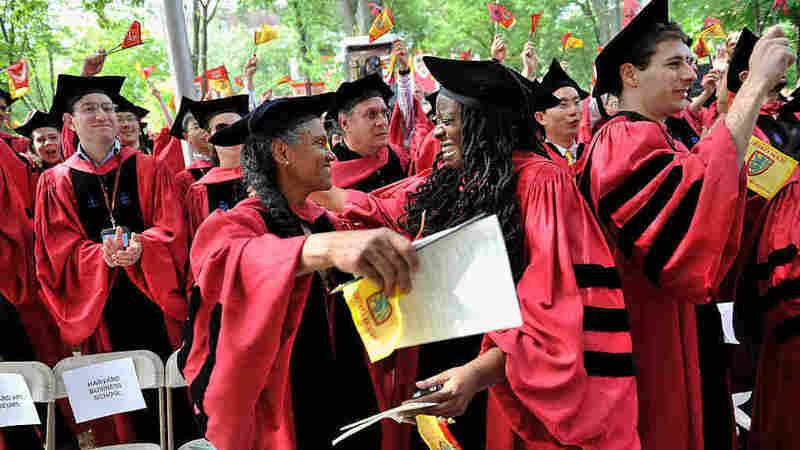 Graduates celebrate during commencement ceremonies at Harvard University. The pace of job creation slowed substantially last month, the Labor Department said Friday. Employers added 160,000 employees in April, downshifting from the monthly average of 192,000 workers so far this year. That was a disappointment for many job seekers. But the country does have one group enjoying lots of opportunities: newly minted college graduates. In fact, economists say this might be the best time to be graduating in a decade. While the overall unemployment rate held steady at 5 percent last month, the Labor Department says the rate is only about half that for college graduates. And the freshest grads — the ones getting diplomas this month — are particularly attractive to employers, according to Andrea Koncz, research director for the National Association of Colleges and Employers. Companies are seeking the young and educated to replace baby boomers, Koncz said. "They are continuing to increase hiring knowing that there are retirements, there are open positions to fill, and ... it's important to keep new college graduates in their talent pipelines," she said. Nearly 3 out of 4 employers surveyed by CareerBuilder, a job search engine, say they plan to hire 2016 graduates, the highest level of hiring in nearly a decade. This year's graduating seniors are stepping into a generally healthy marketplace: Job openings have been running at nearly record highs, with roughly 5.4 million vacancies, according to the Bureau of Labor Statistics. That's very different from a few years ago when the Great Recession was still depressing hiring and wages. The National Bureau of Economic Research found that "graduating in a recession leads to large initial earnings losses" of about 9 percent. "For young workers just entering the labor force, being lucky enough to graduate into a tight labor market like ours today can have a huge impact on wages and career prospects," said Andrew Chamberlain, chief economist for Glassdoor, an online job and recruiting marketplace. Mohammed Ahmad, who is finishing up his MBA at Stony Brook University in New York, told NPR he knows he is lucky to be graduating now. His bachelor's degree is in pharmacology, so his resume matches up closely with his older sister's. She also earned an MBA to layer on top of a medicine background. But there's one big difference. He is graduating now, and she graduated right into the jaws of the recession. So when Ahmad sat down to send out his resumes, "within like about 20 minutes to a half hour, I got a phone call ... and I scheduled an interview." When his sister sent out resumes, she had a very different experience. "She would constantly be applying, wouldn't be able to hear back. And if she did hear back it would be for positions she wasn't interested in," he said. Employment experts say the most in-demand jobs today involve technology, business and engineering. Friday's jobs report underscored such trends. Professional and business services added 65,000 jobs in April. By contrast, jobs in mining and logging fell by 8,000, piling more losses on top of an already-long losing streak. The leisure-and-hospitality sector, which also offers jobs for noncollege graduates, added only 22,000 workers in April. That's the smallest gain in a year. Even though overall hiring slowed, raises showed momentum. Average hourly earnings for private-sector workers rose by 8 cents, to $25.53, in April. Compared with a year earlier, wages are up 2.5 percent. Nariman Behravesh, chief economist for IHS Global Insight, said in his analysis that those pay gains were the bright spot. With more money in paychecks and less pain at gas pumps, most Americans are in better financial shape. "The April weakness in payroll jobs is temporary," he said. "In the coming months, jobs growth will rebound to 200,000 a month, or possibly more. Most indicators of the labor market continue to point to ongoing strength." WSHU reporter Charles Lane contributed to this report.